You say Po-TAE-to and I say Po-TA-to. Even the names are beautiful, humble and poetic. So useful. So nutritious. So versatile. So comfortable and comforting. Just in case you’re wondering, all Russet potatoes are Burbanks, but not all Burbank potatoes are russet. The Russet Burbank is described as a natural genetic variant of the Burbank potato. It has a russet-colored skin that visually identifies this potato type. The Russet is the world’s predominant potato used in food processing, so you have probably seen a lot of them and eaten even more. I grew up in a meat and potatoes household. Although my mom grew a garden full of a wide variety of vegetables, my dad really only believed that there were 4 kinds of vegetables worth eating. Those were corn, peas, beans and potatoes. As a result, most of our meals were created with those basics but there was always plenty! If we didn’t have enough production of potatoes from the garden, my dad would stop by a roadside stand in the fall and buy a bag of 100 pounds for about $4. That would last us through the winter and into the early spring. In the fall, potatoes are at their least expensive and best quality compared to any other time of year. Buying them in bulk and storing them is as good an investment now as it was when my dad was doing it in the 60’s. Storing potatoes is one of the earliest self-sufficiency skills I learned. We always lived in an old house with an unfinished cellar. We would put the potatoes down in the basement in a barrel and just go to collect what we needed when it was time to make supper. Once in awhile we would come in contact with a slimy potato that had to be tossed out. We were warned that we should always bring up anything that had been in contact with the bad potato so they could be used right away. As kids, the science wasn’t explained to us. It was just the rule. Now that I understand the science, it’s still a rule that I live by. Choose a potato variety that is appropriate for storage. My favorite is Kennebec. Some like Russet. There are others. The grocer or garden center should be able to tell you which potatoes are going to be good for storing. You can also go online to find the attributes for most vegetables. Raw potatoes should not be washed before storing. Remove the big chunks if you have been digging during a wet season. However, a powdery coating of dry soil toughens the skin and helps them stay dry longer in storage. Check all potatoes over for spade cuts or bad spots. If there are soft spots, cut away the bad section and use only the good one or discard the whole potato. Do NOT store anything with a bad spot or spading fork cut. After sorting, store the unwashed raw potatoes in any place that is dry, cool (but not cold) and dark. Exposure to sunlight will cause the skin to go green, get bitter and can cause illness if you eat a large quantity. Frequently check your stored potatoes for any that have developed soft spots and discard them immediately when you find them. Wash and dry any potatoes that are in contact with a bad one during storage. Keep it apart so it can be used soon. With smaller houses and less storage space, it is still possible to find good storage for potatoes. One way is to store them in milk crates in a pantry, cool closet or heated garage alongside an outer wall. If the area has a window, drape a heavy cloth over the whole stack. With the coolness of the wall, the airflow created by the construction of the milk crates and the dark provided by the cloth, it works beautifully. As the potatoes at the top are used, take the crates out to store and start on the crate below it. Also, if you have a rarely used, cool bedroom; a layer of crunched up paper under potatoes in an under-the-bed container is the perfect place for storing them. Winter squash and pumpkins can be stored there also! The main idea is to keep them dry, dark and cool but not frozen. 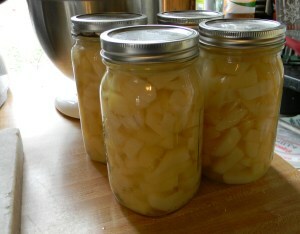 Another favorite way to store potatoes is simply to put your pressure canner into play. As with other vegetables, canning potatoes is a great way to control the salt level and quality of the food as well as customizing the cut of the finished product. Fast Food at its Finest! For best results, the potatoes should be washed and peeled before cutting into your favorite shapes – slices, cubes, shreds or small whole potatoes. A mandolin is a useful tool when cutting potatoes into thin, even slices. Be very careful when using a mandolin because it has an extremely sharp edge. A French fry cutter is great for making cubes. Simply put the potato through the cutter and then cut the ‘fries’ into chunks. This cuts the potatoes into really nice sized cubes. Always follow the instructions for canning that came along with your pressure canner. Do NOT try to pressure can anything completely absent of salt. A little salt is absolutely necessary for successful canning. Once the potatoes are processed and cooled they are ready to eat! You can rinse them, cold and use them in potato salads. You can microwave them to have them warm. You can mash them with garlic and butter. You can drain them, dry them and fry them with your favorite seasonings for fantastic hash browns. In a pinch, you could eat them straight from the jar! The potato is the workhorse of the pantry. It is low in saturated fat and sugar. It has no cholesterol or sodium unless you add it. It is also high in potassium and vitamin C as well as very high in vitamin B6, the vitamin that helps to improve moods. If you have stories or recipes using potatoes, I would love to hear from you. Please share them by adding your comment to this post or contacting John at John@JohnMuellerBooks.com.